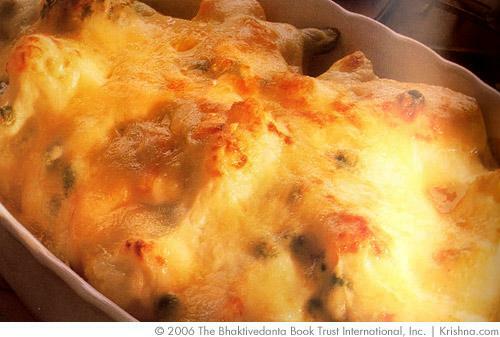 This rich favorite consists of lightly steamed vegetables in a Mornay sauce, topped with grated cheese and baked until golden brown. It combines wonderfully with a light soup and bread accompaniment. Serves 6-8. This particular recipe is from The Higher Taste cookbook which is a great little cookbook with some absolutely fabulous recipes in it. 1. Lightly steam the vegetables until cooked but still a little firm. 2. Melt butter in a medium sauce pan over moderate heat. 3. Remove pan from heat. Add the asafetida powder and nutmeg. 4. Stir in the flour with a wooden spoon to make a smooth paste. 5. Gradually add the milk, stirring constantly. Return the pan to the heat and bring the sauce to a boil, still stirring. 6 .Reduce the heat to low and simmer, stirring constantly, for 1 minute or until the sauce is thick and smooth. 7. Add the salt, pepper and half the grated cheese. 8. Add the steamed vegetables and mix well. 9. Spoon the vegetables into a buttered baking dish. Cover them with the remaining grated cheese and dot with little pieces of butter. 10. Bake in a preheated, hot oven 400 F / 205 C for 25 minutes or until the top is golden brown. 11. Garnish with chopped fresh parsley and serve hot.